or, what we talk about when we talk about Eileen Fisher. you know that feeling when you stumble upon a piece unexpectedly, and it completely clicks with your mood at the moment? i ended up buying these pants that day, and brought them with me to Japan. they proved to be the perfect essential travel trousers – comfy and stylish for a day of sightseeing, and easily dressed up for nice dinners and nights out. the all-important fact that they're a silky viscose jersey meant easy packing, and no wrinkles to worry about. fabric-wise, they're a lighter midweight viscose that drapes wonderfully. i love that these are not dry-clean only, unlike half of the beautiful jersey garments out there these days. i've since washed them several times (cold water, hang dry), and they wash and wear well – no shrinkage, seams, or pilling issues. definitely one of my favorite spring purchases. i think my love of these pants prove a certain point about how our shopping and style sensibilities evolve as we get older. have you ever not gone into a store because of preconceived notions about that brand? or liked something in the store, only to leave it on the rack because of the brand? i'm a bit young to be the target demographic for the Eileen Fisher woman, so technically this isn't an 'obvious' go-to choice for someone like me. honestly, i would not have bought these pants when i was 24. now, though, i believe in breaking out of the Brand Mold and buying what you like, what suits you, and most importantly, the best version of what you're looking for. i'll be keeping an eye out for more EF pieces in the future. what do you think? do you sometimes fall under the spell of Brand Tyranny? have you bought anything 'uncharacteristic' recently? mmm well said. re the material - i don't always gauge quality by thickness of fabric; of course as long as its appropriate and not sheer for the design. for me it's more important that the fabric washes/wears well. that said, i do agree that it's very much a mixed bag out there these days, and one really has to be discerning to not be swayed by brand marketing to buy something worthy. I totally appreciate the thoughtfulness of the above comment. I think the pants look great on you! Wondering if they are from the petite line, as Eileen Fisher always ran huge in my memory. I used to live in NYC and one of the great advantages there is that there are so many shops and you can go in and try things you wouldn't normally try, risk-free. It is so much harder to do that shopping online unless you have endless cash that you can tie up. So often it's the sizing that is at issue -- most of the time online size charts aren't terribly accurate. And then of course unless you're super familiar with a brand and that brand happens to be pretty consistent, you don't know what you're really getting. It gets to be a total hassle all the guessing and researching and returning stuff (one reason I appreciate the guidance offered by this great blog!) So that is often the main reason I default to J. Crew, Madewell, brands like that, because #1) I understand their sizing for the most part, #2.) they allow returns to stores, which means refunds take way less time, and #3), they have pretty good return policies so that even if I wear something and there is a problem, I can usually convince them to exchange or refund or address it somehow. So that customer service makes a huge difference. All of which is to say that living in versus out of NYC has changed my shopping habits and my willingness to take risks, just because of the sheer time and hassle involved in it. That said, again, blogs like this really help by vetting stuff that I otherwise might not consider! Thanks! thanks for chiming in Aurora :) and yes sometimes it is *much* easier to be able to go to the physical store! these EF pants are from the regular size, not petite. they're slightly loose at the waistband but since i really like the overall fit it's not a dealbreaker. I tried an EF dress a few months ago -- though I'm decidedly not their target demographic, the emphasis on corporate responsibility, simple design and no-fuss care was appealing. Unfortunately, it was enormous and shapeless on me in an XS - and I'm slender but not tiny. From the online reviews I've read of the brand, it seems that sizing down is often recommended, which I think puts me out of the game for most of their garments. 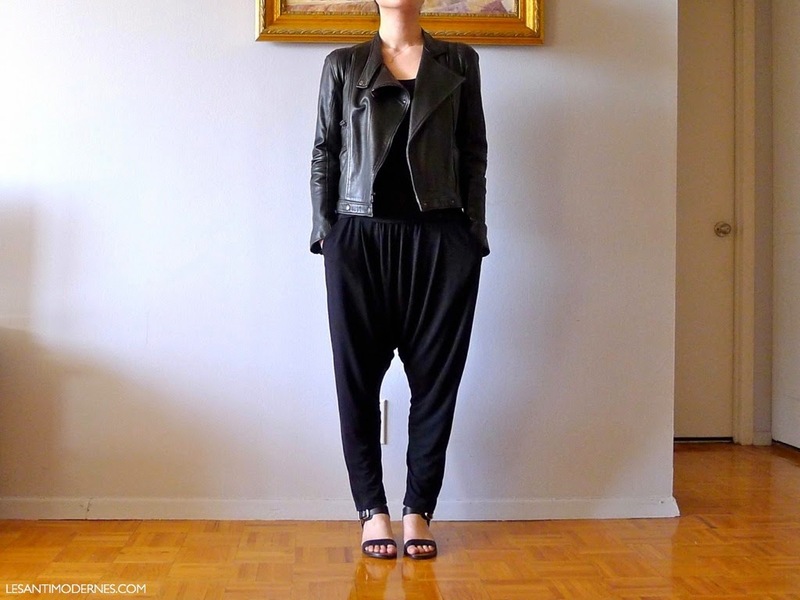 I never considered for 1 second harem pants as other than a novelty but they look great on you styled that way. I dont think they would look quite so light hearted and easy breezy on me b/c they need a tiny waist to even out the volume below. As for uncharacteristic purchases, I am thinking about black leather ankle high converse sneakers but I'm a tiny bit concerned they will come off as overly busy 3rd rate RO ankle (mid shin-hi?) Black leather sneakers. Any thoughts you have on those converse sneaks would be much appreciated miss sophie! Try the petite line. I am usually a Small or XS in common brands like J. Crew, and bought a gorgeous silk/cotton drapey sweater from EF several years ago, but it was the SMALLEST size in their petite line. 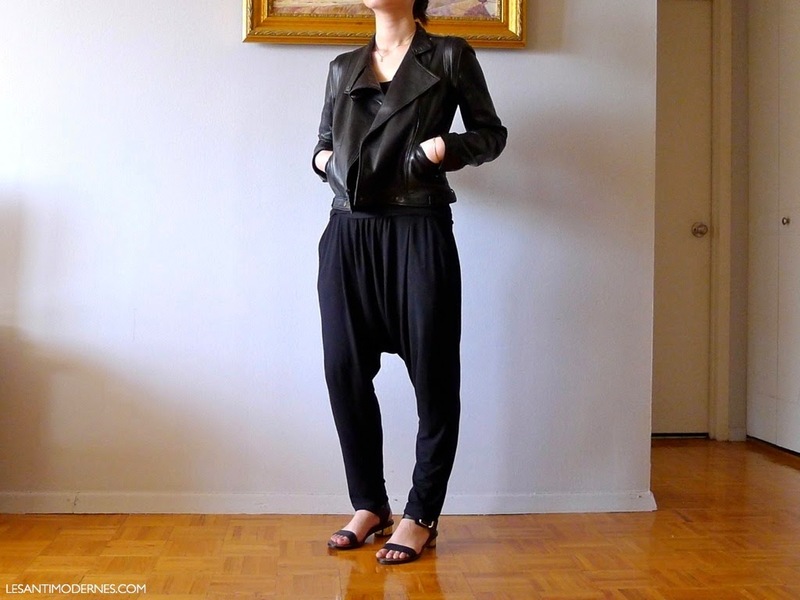 Lots of bloggers wrote about these pants last year--both pro and con. You look so chic. My daughter--age 23--loves Eileen Fisher! The petite sizes are currently 30% off at Nordstrom. thank you FS - that is very sweet! love that your daughter likes what she likes at such a young age! TOTALLY a brand judger here. this mostly applies to cute shoes that i might see in a department store, but then turn by nose up at because they are by jessica simpson (i don't dislike her; i just can't buy her line)! around 90% of my wardrobe is made by small, independent designers who make their clothes in the US. i like to be able to e-mail the people that make/design what i wear, so that's a big part of why i don't buy in to other brands, and have, i would say, a more limited designer repertoire. i think sticking to the idea of sustainability and small batch/handmade makes it easy for me to walk away from brands that don't fit this model. i fully realize that i may be missing out on things, but i'm ok with that. it's part of how i've decided to cultivate my style. i also realize this is a luxury--and i also know the pain of scrimping and saving to do this. i understand that not everyone can do the same, or would want to do the same. by the way, i have to tell you that i love your trinas with the drapey pants and leather jacket. i would never put those items together, but i love the hard edge/drape with such a feminine touch. it's daring in a way that is not over the top. outfit magic. thanks Jade! i really appreciate your approach to supporting smaller designers.